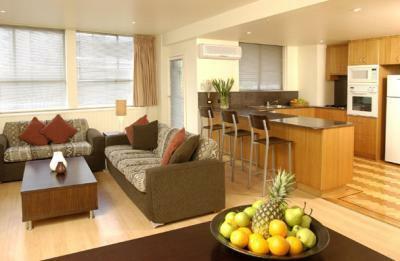 Melbourne Stay has been specifically designed to help travellers who are looking for long term accommodation in Melbourne. These properties provide families, couples and individuals with the perfect place to stay for an extended period and enjoy all of the sights and sounds of the city. 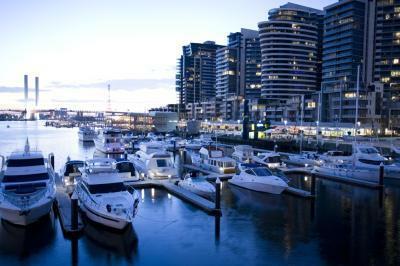 Right across Melbourne there are plenty of furnished properties that offer something for everyone, whether you are looking to relocate the family to Melbourne, want to explore this vibrant city on a relaxing holiday or are after the ideal corporate accommodation complete with all of the business facilities available. All different types of travellers will enjoy staying in Melbourne because the city is so easy to get around and there is just so many exciting things to see and experience. 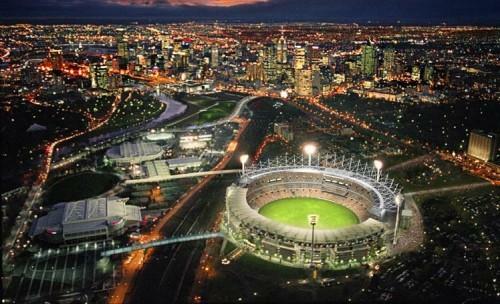 As far as furnished accommodation goes there are a large variety of hotels, serviced apartments and backpacker hostels in the Melbourne CBD and also the surrounding suburbs of Southbank, Docklands, Carlton, East Melbourne, St Kilda and South Yarra. The accommodation ranges from luxury 5 star hotels where everything is taken care of through to fully self contained apartments for the more budget conscious traveller. 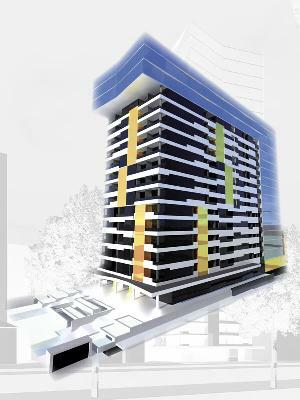 The BreakFree on Collins provides a range of inner city apartments that are well equipped and idealy located on Collins Street in the heart of city. With all of your long term accommodation needs taken care of with discount rates for longer stays this affordable property also includes free Foxtel in all of these studio, 1 and 2 bedroom serviced apartments. 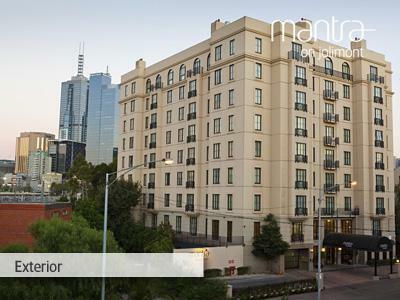 Staying at the Mantra St Kilda Road Apartments in Melbourne you will have the convenience of Melbourne's tram network right outside the door, providing you with easy access to all of the major attractions and businesses in the city. 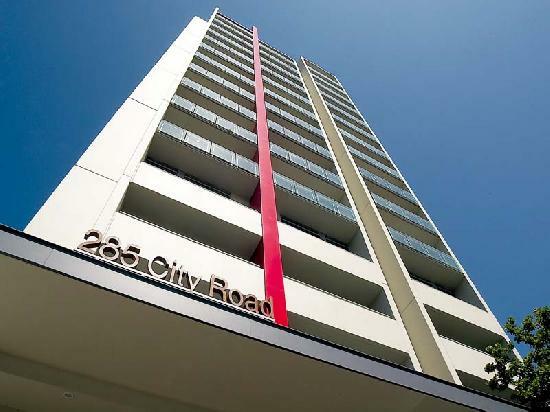 This affordable property has a selection of stylishly appointed studio & 1 bedroom self contained apartments on St Kilda Road for you to choose from. 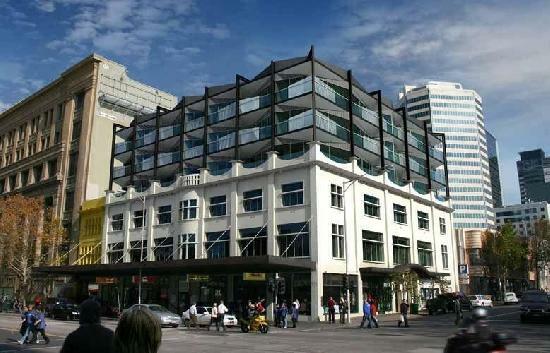 If you are after city accommodation that is fully self contained but does not cost the earth then the City Edge on Elizabeth Apartment Hotel is the place for you. It has a range of studio, 1 & 2 bedroom serviced apartments that are positioned in the Melbourne city centre and will suit the budget of travellers looking for a short holiday or an extended stay in Melbourne. 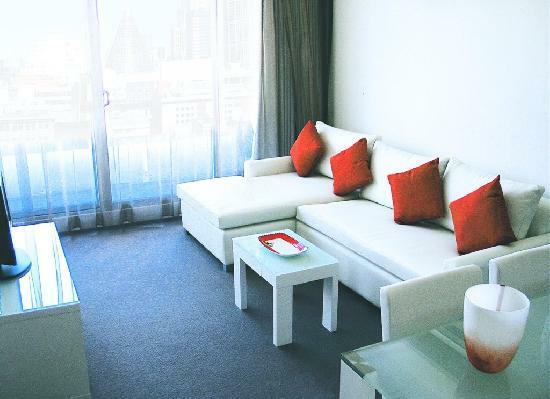 At the Plum Southbank Serviced Apartments there is a wide selection of 1, 2 & 3 bedroom self contained apartments that are conveniently located close to Crown Casino and the city centre. 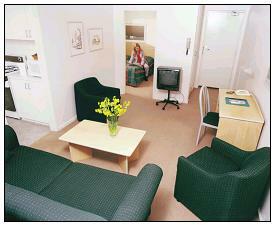 This long term accommodation in Southbank has discount rates for people who are looking to stay longer and allows guests to relax in the comfort of their own spacious apartment. Staying at the Docklands Apartments Grand Mercure you will be able to marvel at the fantastic views from your own spacious apartment that is fully self contained for your convenience. This affordable long term apartment accommodation has easy access to the CBD and well as most of Melbourne's other major attractions, theatres, restaurants and sporting venues. 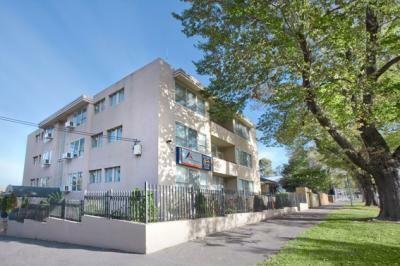 The quality accommodation at the Carlton Apartments Residence is situated in a convenient Melbourne location and comes in the form of well appointed studio, 1 & 2 bedroom self contained apartments. This property is close to the Lygon Street Italian precinct and the heart of the Melbourne CBD, but far enough away to retain a quiet and peaceful atmosphere. 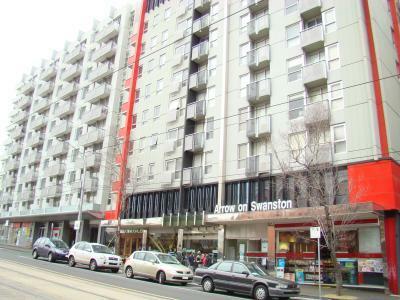 The Stanton Apartments prides itself on providing people with budget 2 & 3 bedroom self contained serviced apartments that are ideal for long term accommodation and families relocating to Melbourne. The property is only 4 kms from the Melbourne CBD and also features a an indoor heated lap pool, spa, sauna, fitness room, BBQ area & guest internet access in reception. 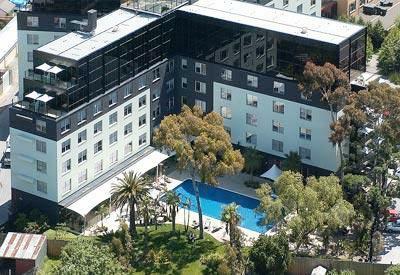 The Park Regis Griffin Suites Melbourne provides a selection of hotel accommodation rooms and 1 & 2 bedroom self contained serviced apartments that is conveniently located between the Melbourne CBD and St Kilda Beach. Whether you are travelling to Melbourne for business or pleasure the Park Regis Griffin Suites offers the ideal accommodation form your next short or long term stay in Melbourne. The self contained studio, 1 & 2 bedroom apartments that the Punt Hill South Yarra Grand provides travellers with are perfectly located in the middle of fashionable South Yarra. This great positioned along with a wide array of features including a spa, gym, 24 hour reception and friendly service is what makes this property ideasl for relactions and long term stays in Melbourne. If you are looking for budget studio & 1 bedroom apartments in the inner city of Melbourne then the Drummond Serviced Apartments Carlton is the perfect place for you. 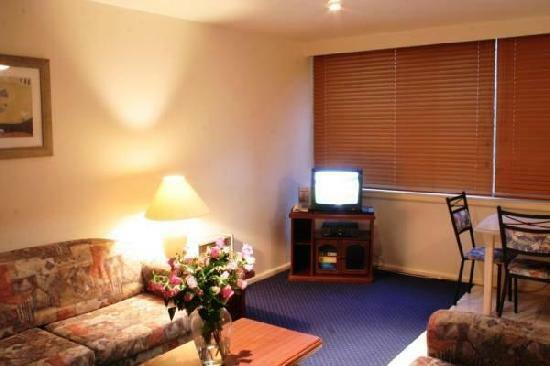 It provides all travellers with quality leisure & corporate accommodation next to famous Lygon Street and just a short distance from the Queen Victoria Market and Melbourne Zoo. If you are looking for budget long term accommodation in Melbourne a stay at the Budget 1 Hotel in Preston is the place for you. 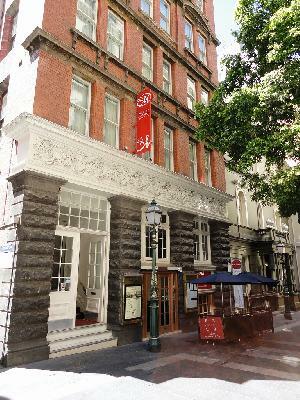 This hotel provides travellers with discount accommodation that is between the city centre and Melbourne Airport, as well as being close to the restaurants on Smith and Brunswick Streets in Fitzroy. 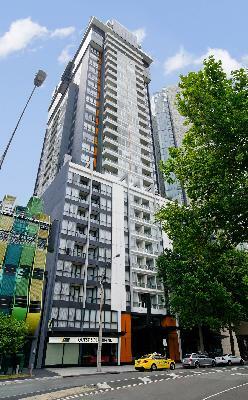 Featuring a number of studio, one and two bedroom serviced apartments the North Melbourne Serviced Apartments specializes in providing travellers with affordable long term accommodation that is close to the Royal Womens Hospital & the new Royal Childrens Hospital, as well as being just a short tram ride away from the Melbourne city centre. 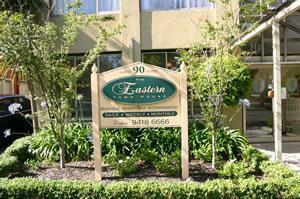 Each self contained apartment at the Eastern Town House is comfortable and very affordable. These contemporary boutique style apartments and fully furnished and provides travellers with an inner city lifestyle that has to be experienced to be believed. The Eastern Town House Serviced Apartments is just a short walk from many of the city's attractions and is guaranteed to not break your budget. Perfectly located in the centre of the Melbourne CBD the Milano Apartments gives travellers the choice of spcaious 1 and 2 bedroom apartment accommodation that has all of the in-room facilities to ensure a relaxing stay. The Milano Apartments Melbourne have been specifically designed for corporate business travellers as well as holiday makers who are after a central place to stay in the city centre. 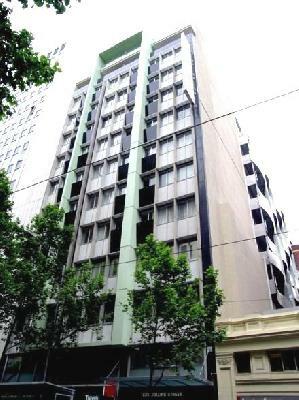 With a range of luxury studio & 1 bedroom fully self contained apartments that are ideally situated right in the heart of the Melbourne CBD the Metro Apartments on Bank Place provides some of the best value for money long term accommodation, all just a short walk from Melbourne's most popular and vibrant night clubs, shopping, restaurants, sporting venues, tourist attractions and corporate offices. 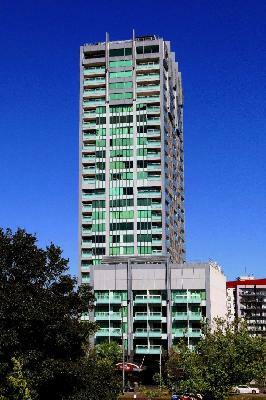 At the Darling Towers Economy Apartments in South Yarra there is a wide variety of 1 & 2 bedroom apartments that are fully self contained and range in styles from 3 to 4 star. This means that they are able to provide cheap long term accommodation for all sorts of travellers with specially discounted rates available if your stay for a long time. Specifically designed for the comfort and convenience of guests the City Edge Apartment Hotels provides a wide range of quality serviced apartment accommodation in East Melbourne that is perfect for long holidays, corporate travellers working in the city and families relocating to Melbourne. 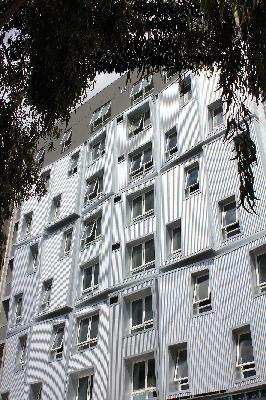 This budget apartment complex is only a short walk from the CBD and the MCG. The studio, 1 & 2 bedroom self contained serviced apartments at the Seasons Botanic Gardens are perfectly positioned on St Kilda Road, which places them only minutes from the Melbourne CBD, Albert Park Lake and the many businesses and corporate offices around the district. If you need affordable hotel accommodation that is located in the Melbourne CBD then the Flagstaff City Inn is a great place to stay. It is positioned only a short 2 minute walk through the beautiful Flagstaff Garden to the Queen Victoria Market and just 700 metres from Etihad Stadium and the many bars, shops and restaurants in the Docklands waterfront precinct. The clean & comfortable long term accommodation that is provided by the Arrow on Swanston comes in the form of budget studio, 1 & 2 bedroom apartments. All are ideally located in Carlton close to the Melbourne CBD, bars, cafes, fine dining restaurants, tourist attractions and sporting venues. 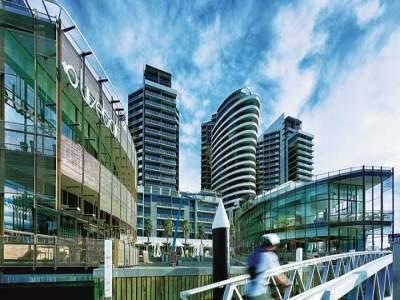 Being able to choose from a range of luxuriously appointed 1, 2 & 3 bedroom serviced apartments with great views, in the heart of Southbank, is what makes Quest Southbank a popular weekly apartment accommodation for both corporate executives and families on holidays in Melbourne. 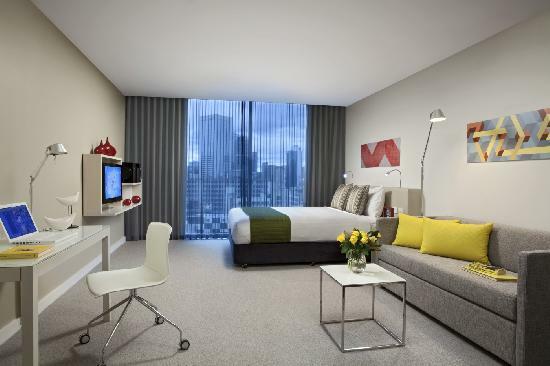 The Citadines Melbourne on Bourke Apartment Hotel offers excellent long term Melbourne CBD accommodation for the discerning corporate and leisure traveller. It features a selection of modern studio, 1 & 2 bedroom self contained apartments that are perfectly positioned in the heart of the Melbourne CBD and close to everything that the city has to offer. At the Accommodation Star Docklands Apartments guests are able to choose from a range of well appointed and stylishly furnished 1, 2 and 3 bedroom self contained apartments that are ferfectly located in the heart of the vibrant Docklands precinct of Melbourne, just a short walk from the city centre. The Amity Apartment Hotels South Yarra provides affordable accommodation is a variety of modern studio, 1, 2 & 3 bedroom serviced apartments that are perfectly situated in trendy South Yarra and just a short walk to the restaurants, cafes, bars and boutique shops on cosmopolitan Toorak Road and Chapel Street. 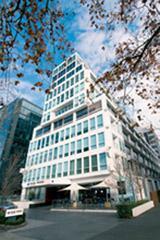 The Mantra on Jolimont Melbourne Apartments caters for business corporate travellers for short and extended stays in East Melbourne with a choice of luxuriously appointed studio, 1 & 2 bedroom self contained serviced apartments that are situated close to the Melbourne CBD, MCG and Rod Laver Arena. 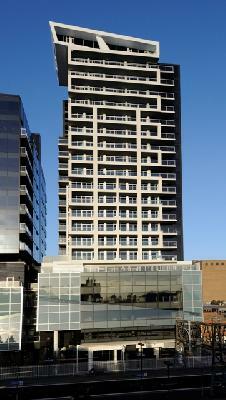 All rates are quoted in $AUD and are inclusive of all taxes. 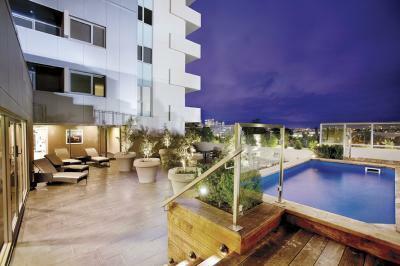 or alternatively you can click here to see all Melbourne Rates & Availability. If you want long term hotel or apartment accommodation in Melbourne at cheap rates for your next holiday or business trip then Melbourne Stay is the place for you. We give travellers the ability to compare a range of hotels, motels and apartments at the same time, thus making it easier for you to decide where it is that you want to stay. The long term accommodation on Melbourne Stay ranges from luxury self contained apartments through to budget hotel rooms that are great for extended stays. So why not book your long term Melbourne accommodation at any of these properties with the confidence that they offer cheaper rates for longer stays.